In addition to standard consolidated reporting, Fathom enables consolidated group reporting for entities with different currencies. Please view this article for a full list of supported currencies. Before creating a multi-currency consolidated group, import each underlying company into Fathom. Note: each company can have a different Chart of Accounts. And consolidated groups can include companies sourced from different accounting systems. To create a multi-currency consolidation, start on the ‘My Companies’ page and click ‘Create a Group’. 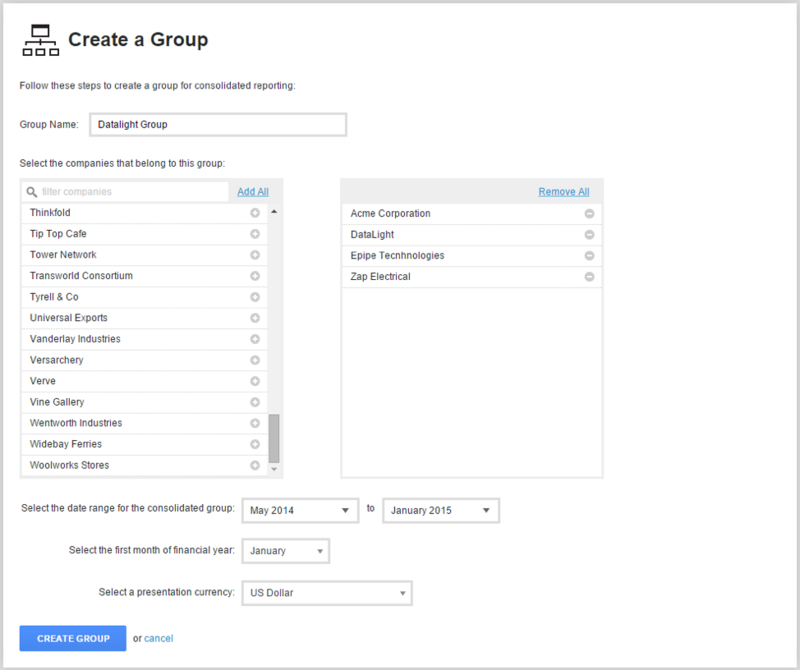 Then select ‘A Consolidated Group’. 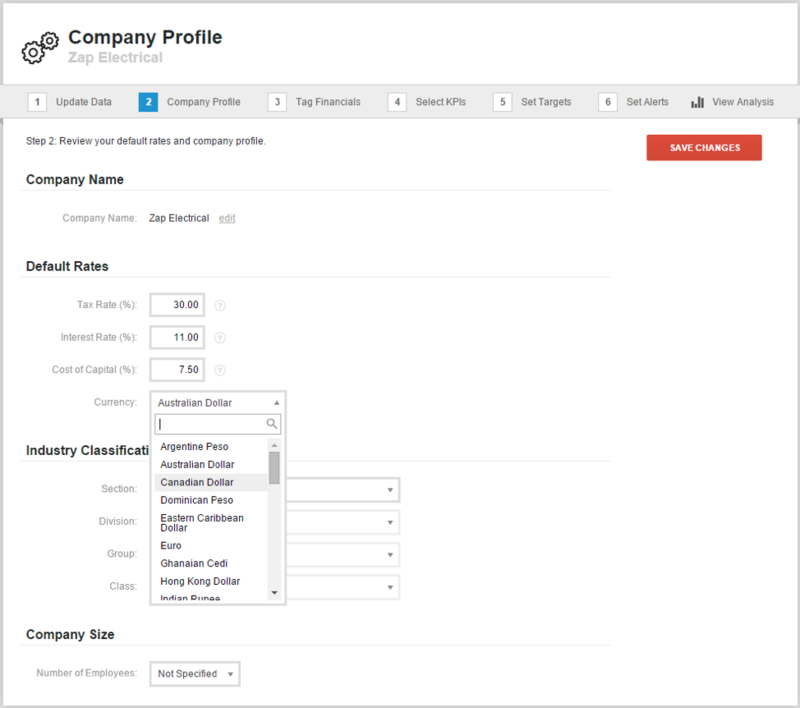 After providing a name for a group, you can select up to 50 companies to include in the multi-currency consolidation. Because companies from different regions often use a different financial year, you will need to choose a financial year to use for the group as a whole. Finally, choose any presentation currency. See this article for the full list of currencies. The multi-currency consolidated group is then created in a few seconds and it will appear as a new company on the ‘My Companies’ page. The financials for each company in the group, will have been translated to the selected presentation currency. After consolidating, you should review the KPIs, targets and alerts and set them accordingly for the consolidated group. Only library KPIs will be included in the Consolidation Group analysis. All of the reports that you are familiar with in a single company are also available for a consolidated group. You can now view profitability, cashflow, growth, trends and more for the group as a whole. There are additional features to be aware of in a consolidated group. Within the ‘Financials’ tool, you can click on any line item on the Profit & Loss or Balance Sheet to discover the breakdown across the consolidated group. 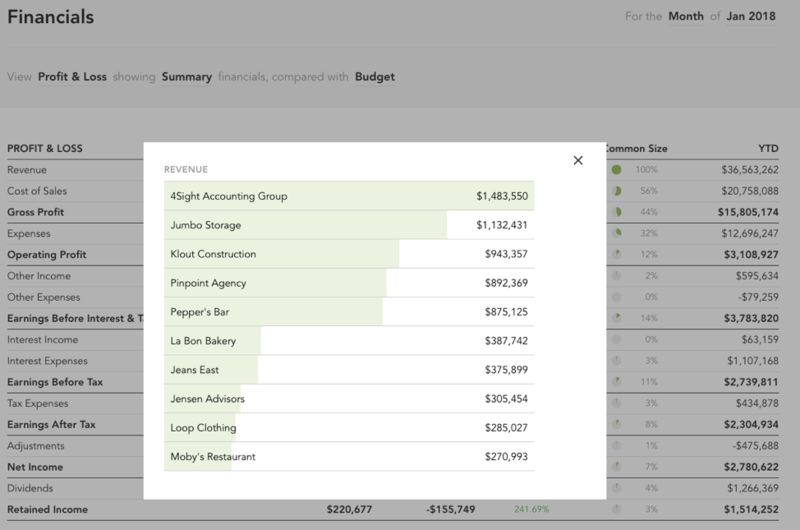 To view a detailed breakdown of your consolidated group with side-by-side Consolidated and Single-entity financials, go to the 'Reports' section to the Excel report titled ‘Multi-currency consolidated financial results, including eliminations’. Inter-company eliminations and exchange rate adjustments are also displayed. The eliminations feature in Fathom assists to remove the impact of transactions between companies in a group, and therefore provides a more accurate view of consolidated performance. A typical use of an elimination would be to account for inter-company loans or inter-company management fees within a group. Fathom also provides a more detailed approach for Multi-Currency eliminations, for more information please refer to this article: Multi-currency Eliminations. Fathom sources historical exchange rates from Open Exchange Rates. Fathom uses an inter-bank (without retail fluctuations), mid-market (average of buy/sell rates), rate which is calculated end-of-day using an average of rates from the preceding day. For monthly data, Fathom uses the average exchange rate over the month to translate the Profit & Loss accounts. Fathom uses the month end exchange rate for translating Balance Sheet accounts. For more information, see this detailed FAQ on Exchange Rates.